In man, an influence of the sleep/wake cycle on the secretory pattern of certain hormones is well documented. 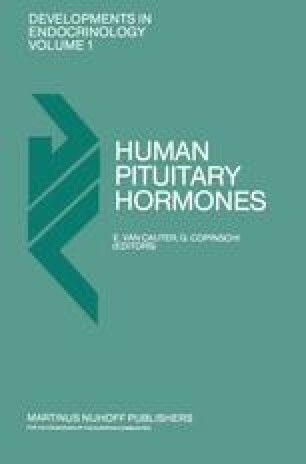 The secretion of growth hormone (GH), prolactin (PRL) — and luteotropin (LH) during puberty — is stimulated by the occurrence of sleep, while thyrotropin (TSH) (and possibly LH during the early follicular phase in adult women) may be inhibited (1). Sleep-deprivation and sleep-reversal experiments have been used to prove that sleep itself affects hormone secretion in these cases irrespective of the time of the day. These studies have revealed that different hormones have different links to sleep. Thus, a major GH secretory episode occurs regularly during the first slow-wave-sleep (SWS) phase of nocturnal sleep and only little or no GH is secreted during the remaining sleep (2, 3, 4). In contrast, PRL secretion increases with the onset of sleep, then the plasma concentration remains elevated and highest values are often reached towards the end of sleep. TSH plasma concentrations attain highest levels in the evening before the onset of sleep, and this seems to be the result of an endogenous circadian rhythm. Original studies of the author were supported by Deutsche Forschungsgemeinshaft.